Time for our regular update as to the gender disparity in rock, a public service announcement at no charge to the reader. Two full years into rock ‘n’ roll’s lifespan and the female quotient is still lagging well behind the men when it comes to the roster of artists plying their trade in this unseemly music. They aren’t being kept out forcibly – so far as we know – but their relative scarcity is shaping up to be a detriment in rock ‘n’ roll’s ability to be reflective of its entire audience. Aside from merely depriving us of higher voices to hear sing this music, a diversity of sound people instinctively crave, we’re also lacking in the different thematic perspectives women would offer which is proving to be the far bigger loss. So that imbalance places something of an unfair burden on the women who ARE actively churning out rock records, each release in effect needing to try and offset ten times as much output as their male counterparts, at least until reinforcements arrive. Yet the women who have joined the party thus far have been more than holding their own which begs the question why more of them aren’t included on the guest list. We shouldn’t have to keep doing this updating of the gender inequities every so often but it remains one of the most noticeable aspects of rock ‘n’ roll at the time and a vital look at the surrounding culture that all music, particularly rock, reflects. Even now, seventy years later, we continue to see disparity in the total number of practitioners, even if the absolute biggest stars of rock are arguably much more balanced. 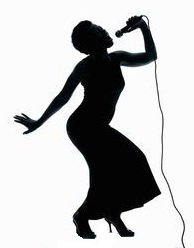 This is particularly strange because women have always made up a large contingent of music fans, their purchasing power every bit the equal of their male counterparts and particularly in the African-American community of the mid-Twentieth Century. Surely songs featuring a female perspective would have inherent appeal to that audience and it’s not as if there was much competition in that field for releases to get lost in. How could it possibly hurt for record companies to sign a few more ladies willing to wade hip-deep in the rock gutter for the chance at stardom? Annie Laurie was the most prolific of the rather thin ranks of the 1940’s women rock brigade, though even she was tied to the fate of a man in the process, as Paul Gayten received label credit alongside her on her releases. Now to be fair Laurie was the singer in his band, that’s how they got together in the first place and of course Gayten was now leading that band in the studio backing her on these sides, as well as writing much of her material, though not this side, and while not officially credited for such he was essentially producing the records as well as arranging them. However let’s point out he was doing much of that behind other male acts as well, both over the past year as well as in the near future, and his name didn’t appear on THOSE labels, so you can see the inherent gender bias that was commonplace in this era which has become rather distasteful to consider today. But there’s one sure way to put a stop to that and it’s for Annie Laurie, and other females like her, to stake their own claim to stardom with their performances and to become the undisputed drawing card on the road and the one who’s churning out hits with regularity. The flip side of this, Cuttin’ Out, would be her first Top Ten hit on the national charts and if she could somehow score with both sides of the single that’d make people stop in their tracks and take notice that the women were every bit as capable as the menfolk when it came to attracting an audience. If ever there was a song that had the potential to do so you’d think it’d be My Rough And Ready Man, a title which could only come from a female who was displaying the same type of brazen attitude that made so many male singers undisputed rock stars. The first sounds we hear are promising, as the guitar trades off with the horns on a ping-pong intro, establishing two sides of the instrumental backing which hopefully will take prominence as the song goes along. But when the horns take the lead we’re already let down. Stop me if you’ve heard this before but they’re too old fashioned, handing the reins over to the higher range while Gayten’s piano is too light in its own right to rivet your attention and establish a strong bottom. Luckily this where Laurie jumps aboard and tries to drag these lazy good-for-nothing men up the mountainside herself. We know she’s got a nice voice, strong, supple and with enough character to more than suffice. Her early shortcomings when it came to projecting deeper meanings of the lyrics she sang have long since been corrected and she’s shown herself to be very capable of getting the listener to share in her sentiments, whatever they may be in a given song. On My Rough And Ready Man the sentiments are veering towards the risqué, which is certainly a good thing for anyone, male OR female, seeking instant rock credibility. The problem though is while her voice makes clear the urge she’s feeling to be with this guy in the sack, she’s only giving us shallow G-rated platitudes to tide us over. There aren’t any details beyond the fact he’s got big brown eyes and she doesn’t want to let him get away. Here’s where we’re forced to go back to the male-female dichotomy and the plain double-standard involved in making records, at least at this stage in rock music. While there certainly are era-related standards of decency to be adhered to that need to be taken into account, it’s no secret that the men have been pushing against those with much more force than the ladies are being allowed to. A good deal of this surely has to do with decorum. Namely the men who ran record companies, as well as those who may spin these records over the air, or stock them in a jukebox, not to mention the men who wrote and arranged them in the studio, all felt that putting a woman in the position of verbally lusting after guys was too unseemly to put on record. There may have been some nobility to this thinking, we’re not questioning that, but let’s not forget these same exact people – the Braun Brothers who owned DeLuxe Records before opening Regal, and Paul Gayten who handled these chores at both labels – had no problems letting Chubby Newsom brag about her OWN sexual attributes on record. Therein lies the difference though… on My Rough And Ready Man the type of song that it is requires Laurie to start naming the GUY’S physical attributes in lusty detail and that seems to be something no guy wants to be anywhere near. As a result the lyrics have no bite to them. There’s no picture she’s painting of him at all, just her own longing for him. Even that is kept to a minimum as they substitute an insipid scatting vocal – sans words altogether – for the middle eight. She carries it off with appropriate enthusiasm, and I’m sure someone might suggest she’s so enamored with this guy that she’s babbling incoherently to herself in anticipation, but no girl with the experience her vocal tone suggests is struck dumb by the thought of any guy, no matter how desirable he may be. Now if all involved made their best case as to the limits they felt they could go to present the “real” action at play here, and you gave them every benefit of the doubt you could, it still wouldn’t explain the band’s decision to soft-peddle the music behind her. That’s where you can bend the rules all you want, where your playing can replicate any and all off-color bump and grind acts when the lights go out. A raunchy horn solo, a jagged guitar riff, a slamming drum beat, piano pounding that sounds as if it’s on the verge of sheer ecstasy – all of those things and more are on the table for any band that sets their mind to it. Just get creative, work it out with Laurie in advance and give her the platform to scream or sigh or moan at different points while you have an appropriate reply at the ready to further the suggestiveness. No actual words need to be spoken, no obscenity laws need be violated, nobody has to risk being ostracized from their community… just make it non-specific in its obviousness. Ambiguous… but not really. Let the listener fill in the gaps. Instead the band plays it safe. The horn refrains are neat and tidy, not loud and raunchy. Gayten’s piano is pleasant, not assertive. Your hopes get raised when the drums kick in leading into Lee Allen’s sax solo, but while he cuts loose with a few crude sounding honks, they’re more humorous than racy. His part is good, certainly the best musical feature of the record, but it’s not elevating this to where it needs to be in order to connect it with the theme and conversely with the listener wanting some more authentic aural recreation of that subject. Annie Laurie does all she can to convey what’s really going on, but when all she’s allowed to do is vaguely reference My Rough And Ready Man but ordered to keep his name out of the papers, then there’s no surprise why this fell short. Content to be just “good enough” rather than aiming to be really great and incite riots. Though it hardly excuses the lack of female opportunity in rock, maybe this does show why a music built on lewd undercurrents was unbecoming for women to venture into. Then again when male artists were bragging about getting laid my guess is it was mostly with women and if they didn’t mind dragging the reputation of dozens of females through the gutter for their own glory – not to mention their own hit records – then women deserved the same chance to debase themselves in search of a hit. Birds do it… bees do it.. but apparently in early rock ‘n’ roll female artists were expected to remain virgins forever. Millie Jackson, where are you now that we need you? 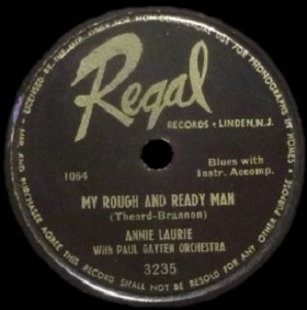 Leave a reply on "Annie Laurie: “My Rough And Ready Man”"